"Sixty-five people have died over the last three days," Edhi told Reuters. A government spokesperson could not be reached for comment. But Sindh province's Health Secretary Fazlullah Pechuho told the English-language Dawn newspaper that no one has died from heat-stroke. "Only doctors and hospitals can decide whether the cause of death was heatstroke or not. I categorically reject that people have died due to heat-stroke in Karachi," Pechuho was quoted as saying. 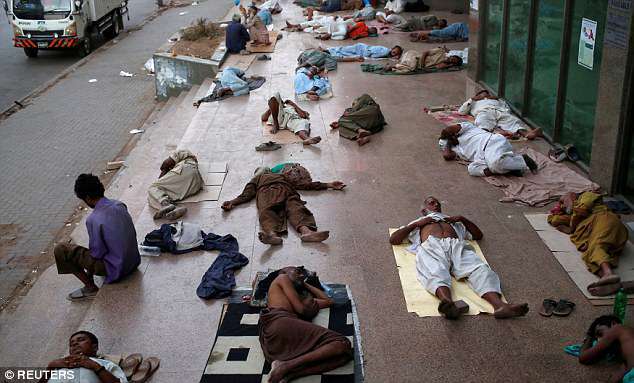 Nonetheless, reports of heat stroke deaths in Karachi will stir unease amid fears of a repeat of a heatwave in of 2015, when morgues and hospitals were overwhelmed and at least 1,300 mostly elderly and sick people died from the searing heat. In 2015, the Edhi morgue ran out of freezer space after about 650 bodies were brought in the space of a few days. Ambulances left decaying corpses outside in sweltering heat. "They work around heaters and boilers in textile factories and there are eight to nine hours of (scheduled power outages) in these areas," he said. Temperatures are expected to stay above 40 until Thursday, local media reported. According to Dawm.com, Karachi can expect heatwaves to increase in the coming years. Heatwaves are a multi-causal phenomenon where meteorological and socioeconomic factors interact to produce often fatal outcomes. Unfortunately, Pakistan’s risk exposure to both these components is rapidly escalating under the rising impacts of climate change and unplanned urbanisation. Mushrooming informal settlements on the peripheries of our major cities coupled with the increasing frequency of extreme weather events mean that recurrence of tragedies such as the 2015 heatwave is more likely than ever before. Based on global experiences, deaths from heatwaves are considered ‘preventable’ as meteorological events alone are unlikely to be responsible for the mass-scale fatalities which usually occur in built environments. Hence, there is a need to make our cities resilient against extreme heat events which are set to increase in frequency and intensity over the coming years and decades.